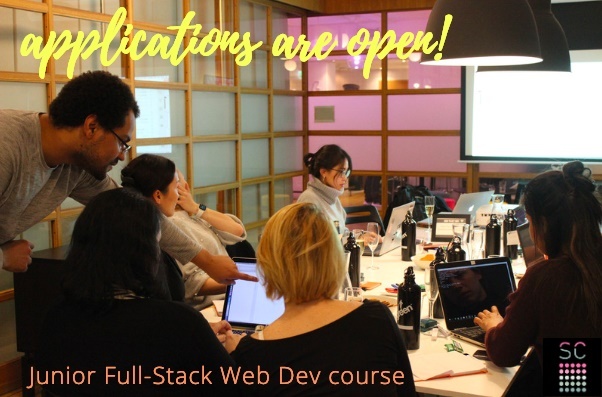 The applications for the Junior Full-Stack Web Developer closed on March 12th 2019. This course is free of charge and available to a woman* (requirements below) that wants to take the next step towards her new career in IT! Starting on April 1st and finishing on June 28th, the course will be based on Full-Stack essentials including some exciting surprises 😉 We will do our best to prepare each individual for the next steps which are the internship and the first part- or full-time job, which are part of this course’s IT career development program**. We are really excited to start the first class on Monday, April 1st which will be conducted by an experienced IT teacher. It is a software engineer with over 12 years of experience. He has worked around the world for organizations such as the UNICEF, Thinkful Inc., Udacity and others. He recently moved to Sweden and is currently involved with work at a famous FinTech startup in Stockholm. COURSES ARE HELD IN ENGLISH! Are you curious about learning how to code? Are you thirsty to sharpen your understanding of building code, that can be used for solving challenges in the future? Or would you like to change your career and need someone to fill you with the right skills? Then we are really happy to load you with IT knowledge! The Junior course will be held at the modern premises of “The Park”, Sveavägen 98, 113 50 Stockholm. The course starts with a group of 10 women. The Junior Full-Stack Web Developer course is free of charge. However, there will be fees for dropping out because each student’s spot is very precious. Therefore we ask you to apply consciously and read terms & conditions that we will send you via email during the process of application. SmartCoding will provide you with the essential learning materials and the equipment, including a computer, for the time of your studying at the junior course. Please be aware that each course spot is of high value thus apply consciously. Also, please be aware that by making a decision to join this course you will also join the full IT career development program** that consists of next steps after the graduation from the course: an internship and first part- or full-time job as a programmer. **At SmartCoding we focus on filling the IT gender gap and promoting diversity and inclusion at the workplace. We offer a career program only to participants of the junior level courses. That program is meant to support each female junior programmer in getting her first internship and then the first job. We believe each fresh course graduate will benefit from using our career development support and IT market knowledge in landing a first project work. In this way, each individual will add to her cv some practical experience which is so much desired by the employers. The career program lasts in total max 9 months (if started directly after the course graduation and without any disturbance). That includes a max 3-month internship and a max 6-month job (part- or full-time or project work).